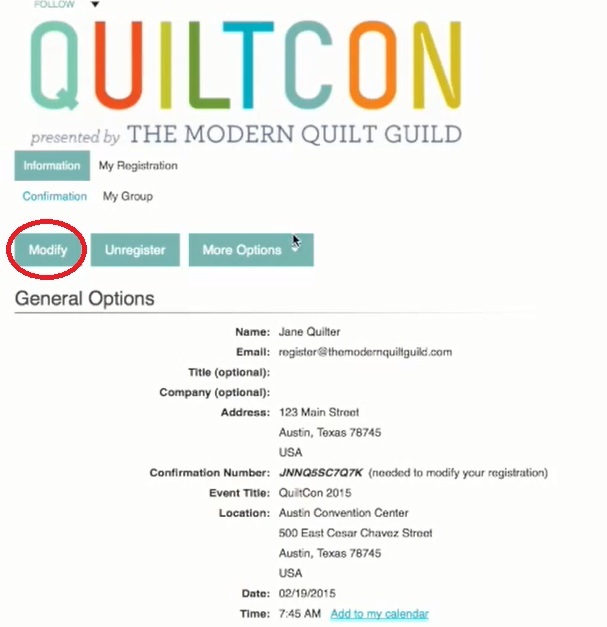 I registered for QuiltCon 2015 today! 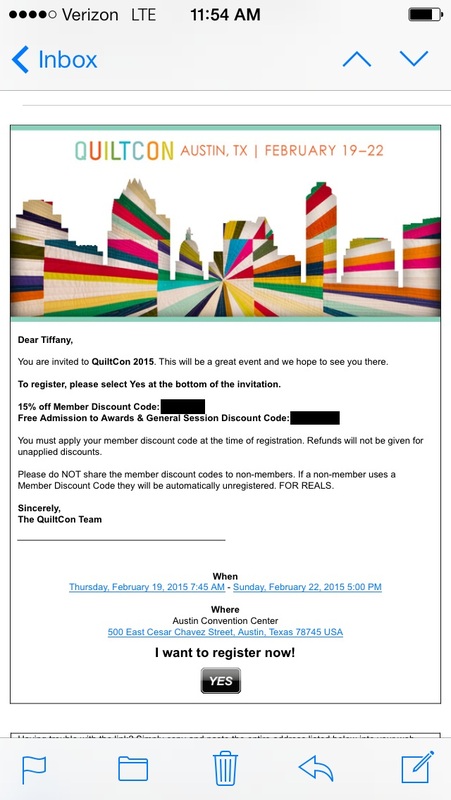 It will be my first-ever QuiltCon, and I am very excited. As a total newbie, I was unfamiliar with the registration process but now have a few observations and suggestions to share. Use the email link. I thought I would be clever and link to the site directly, saving the link-from-email step. I got errors on both Internet Explorer and Mozilla Firefox saying that my session had timed out and was never able to move past those errors to the website. When I clicked the email link, I still experienced a delay, but I was ultimately able to get through. Use a computer instead of a mobile device. I saw this advice on the MQG website and Instagram, so I didn’t even attempt to use my phone for comparison purposes. But I figured I’d still pass along the advice. Register in pieces. Prioritize the workshops you want to attend. If there’s a session you don’t want to miss, register for it first, then “modify” your registration to include additional sessions. There’s a tutorial for doing that here. Each time I clicked a link (including the “Add to Agenda” link for each session), it took about 5-10 minutes. If you consider all the people who could add one session in the amount of time you’re setting up your full courseload, it’s not surprising you could end up with a waitlisted status. Prioritize workshops over lectures. Each time I added a session, I could still see the webpage listing all sessions while the request processed. I used that time to see which sessions were full already. Each session showed remaining seats available below the title. For perspective, about 20 minutes after registration opened, every lecture I saw still had 300+ spots available while at least 4 workshops were completely full (“Add to Agenda” changes to “Add to Waitlist”). Many more workshops had few seats remaining. I was interested to see whether I could guess which workshops would fill up first. I did a pretty good job! Of course all this year’s speakers have impressive backgrounds. Some are always popular, like Anna Maria Horner, whose sessions filled immediately. Most quilters know who you mean if you simply write her initials: AMH. Similarly, Alison Glass and Lizzy House have great new fabric lines; their sessions were full in less than 30 minutes. And Lee Heinrich‘s popular book (she’s one of three authors) also meant her session filled quickly. 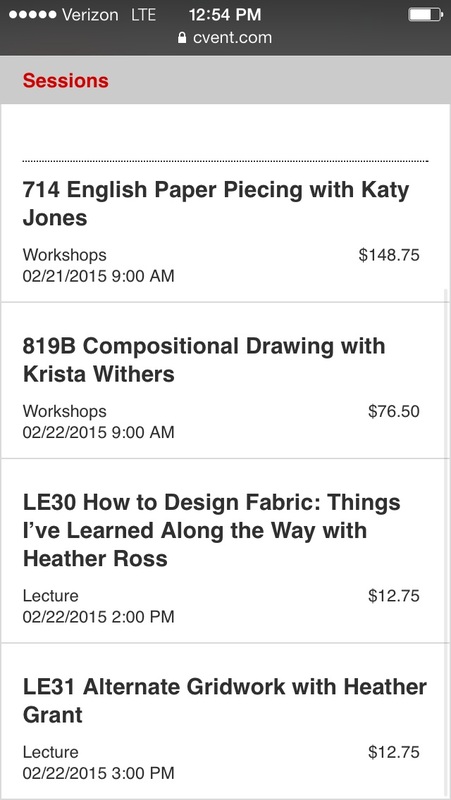 If a designer or quilter is all over Instagram, (s)he is going to have full sessions. Duh. The courses above appear to be this year’s hot ticket items. If you got into these courses, congratulations! Don’t “search” for courses. As noted above, each time the page refreshes (i.e. each time you click anything on the screen), you waste precious minutes. Running a search means that instead of scrolling down the page quickly, you have to wait for the page to respond to your search parameters and refresh. Instead, locate the course by scrolling down the page. Courses are listed numerically by course number, with the workshop section above the lecture section if you select the “All Registrations” option (versus only lectures or general admission). I am only attending QuiltCon over the weekend since I have to save as many vacation days as possible for my wedding this year. I got into all four sessions that I prioritized! I am nervous since I won’t know a soul at the conference center. If you’ll be there–and especially if you’ll be in one of my sessions–please let me know! I am most looking forward to making some real life connections. Categories: Places & Events | Tags: advice, alison glass, amh, anna maria horner, austin, bill kerr, how to, lizzy house, meadow, quilt con, quilt con 2015, quiltcon, quiltcon 2015, quiltcon2015, register, suggestion, tips | Permalink. Tiffany, you are a woman after my own heart! I love your detailed overview of the registration process! I was lucky and was in and out within eight minutes before the system got extremely slow. I got into my two top choice workshops. I will be in Heather Ross’ lecture with you! Don’t worry in the least that you don’t know anyone, you will meet so many new friends at QuiltCon! I went in 2013 and had the most amazing time. It’s really all about the people, even though the workshops and lectures are incredibly good. And you can’t forget the quilt show! And the vendors! And Austin itself! I’m getting carried away, can you tell I’m excited for QuiltCon 2015? Ooh, I’d like to read that one! You’re welcome. I hope to find you as well, the best part is meeting new friends and reconnecting with old friends.